Uluru. The big rock. After several teasing glimpses and one false alarm, today was the day that we would finally get up close to one of Australia’s most iconic symbols. We cleared our camp site, leaving behind the sprightly little mice that had run rings around our sleeping bags all through the night. But before we tackled Uluru, our next stop was Kata Tjuta. 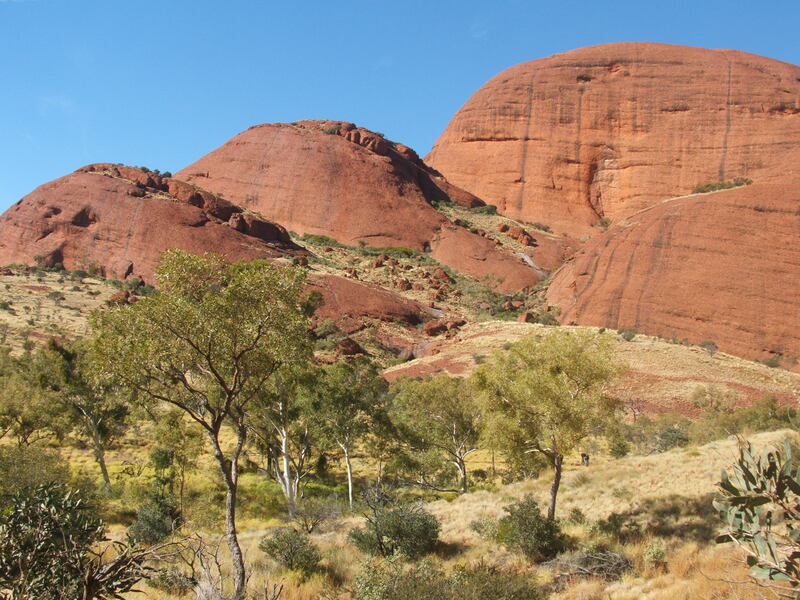 Often outshone by its famous neighbour, Kata Tjuta is not as immediately recognisable as a must-see destination. Yet in some ways, I was even more excited by this excursion. For me, it ticked many of the boxes I was looking for in an adventure. Wild, photogenic scenery, check. Rugged trails to tramp on, check. I put my hiking boots to the test, feeling the satisfying crunch of loose stone and pebbles underfoot as I set off down the path. The Valley of the Winds walk took us through coarse scrubland as it weaved its way between a series of orange mounds. Like mammoth molehills, the ancient rock formations rose up against the clear, azure sky. Once again, I was surprised by how lush parts of the Outback looked. I expected to spot the odd withered bush or dried out tree, but beneath the colossal domes sprawled a whole garden of greenery. Next up was Uluru. I’ve heard some people say that it’s just a rock, and what’s the point of travelling all the way to the centre of Australia to see it. After all, rocks in the Outback are hardly in short supply and we’d spotted several impressive ones already. Yet there was something about Uluru that felt distinctly special. Maybe it’s the remoteness of the location, the vastness of the monolith, or the associated Aboriginal culture. For me, I think it represented how far I had come on my travels – from having barely strayed beyond the borders of my own country, to finding the courage to fly solo to the other side of the world. Something which was once just a picture on my computer screen had now become a physical reality before me. 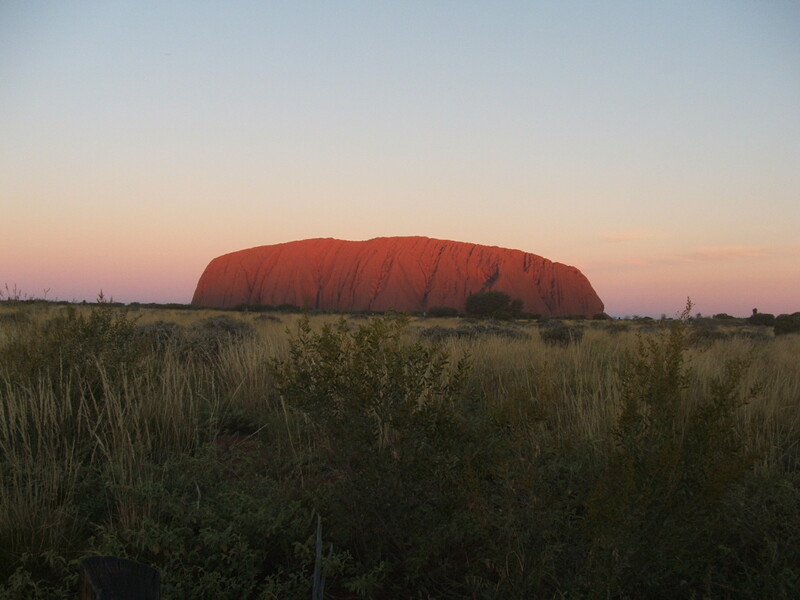 For our second night of camping, we stayed a stone’s throw from Uluru, allowing us to catch the awesome sunrise. Swaddled in our sleeping bags, we watched the first rays of dawn transform the colours of the rock face. After a quick breakfast, we rolled up our swags one last time and finally made our way to the main attraction itself. In addition to the three hour base-walk around Uluru, there was the option to climb to the top – something which our guide advised us against. 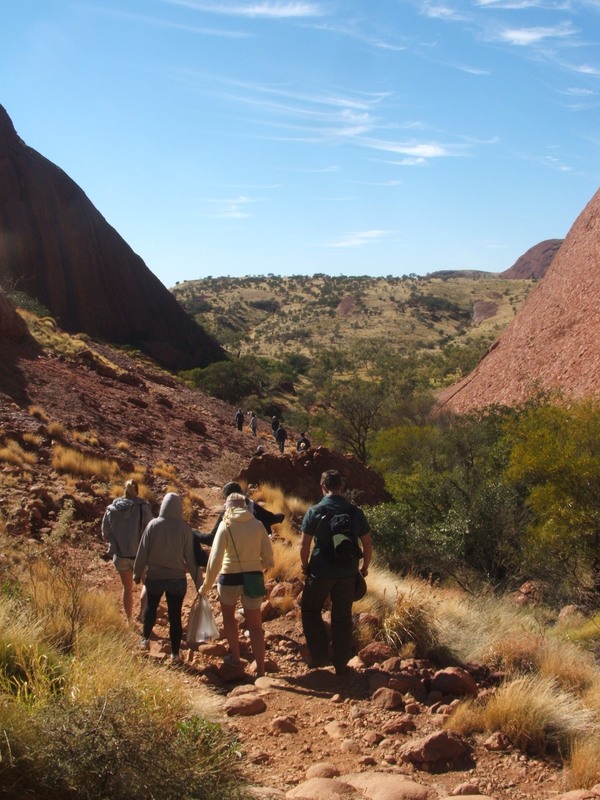 Firstly, Uluru is sacred to the Aboriginal people, and as traditional owners of the land, they request that visitors don’t climb. Secondly (and perhaps more pertinently) the trail is quite treacherous. With nothing but a flimsy chain to grip, it’s easy to slip during the steep ascent. Plaques commemorating those who have died are a testament to the danger. The climb didn’t appeal to me, but a couple in our group had their heart set on scaling the rock. In the end, the decision lay with Mother Nature, and it was closed due to windy weather. Compared to Kata Tjuta, the walk around Uluru felt like a gentle stroll through a museum, as we paused every so often to look at the unique geological features and ancient rock art. We took our time, admiring the scenery whilst learning about the spiritual significance of the site. It was a pleasant finale to my Red Centre trip, and I was glad that I’d spent a few days exploring it rather than flying directly to Ayers Rock airport. 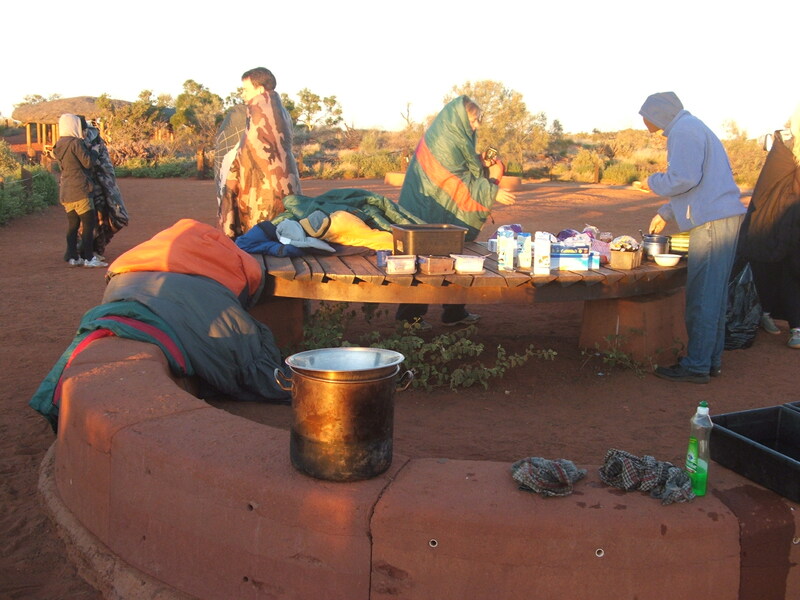 Although I thoroughly enjoyed the trio of Uluru, Kata Tjuta and Kings Canyon, the real highlight for me was sleeping in a swag under the stars. 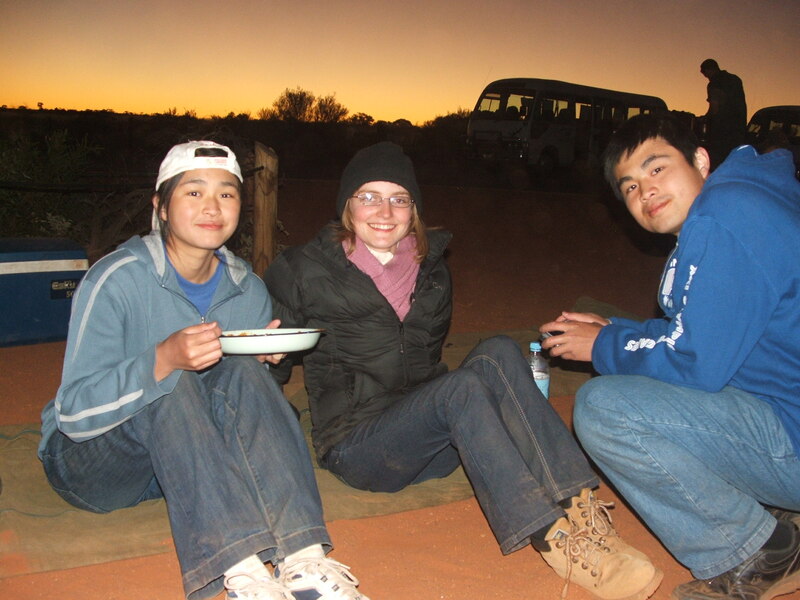 I loved every minute of camping in the Outback – even the mischievous mice!